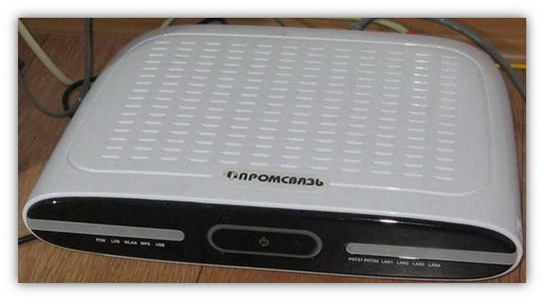 The Windows is connected to the Bulgarian Vivacom Intrnet provider through their ADSL service and hence there is an ADSL router modem which is configured to disallow all inbuond connections by default. The Windows Pro PC where the VNC server was needed to be accessible did not have a real IP address (e.g. 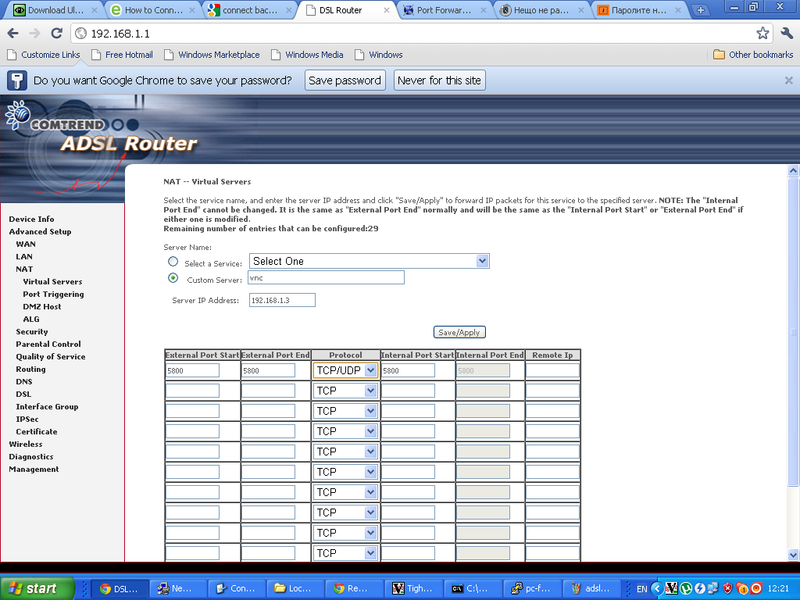 was assigned a virtual IP address by the ADSL modem. After a few minutes spend in Google I already had found few passwords which were said to work fine with the Vivacom ADSL router. I tried some old school brute force techniques 😉 by trying all the passwords via the ADSL web interface located on http://192.168.1.1 (I was not sure which model the Vivacom ADSL modem is as on the router there was nothing written concerning the modem type but only the Vivacom logo was present. 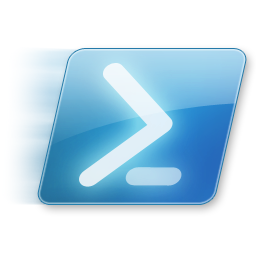 Next in the NAT — Virtual Servers section I pressed the Add button to create new automatic redirection (port forwarding) rule. 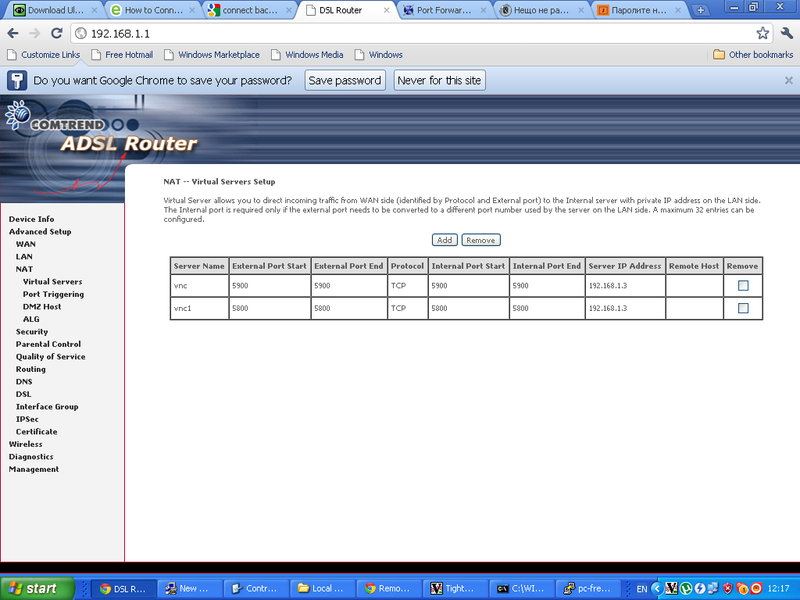 Configuring ADSL SmartAX MT882 TightVNC NAT port redirection screenTightVNC requires also NAT port redirection rule for port 5900 in order to be able to connect to the VNC server behind the dsl, so analogically I added a Virtual Server NAT rule for port 5900. Further on I expected the adsl port forwarding created rule would now allow me to connect to the VNC server on the pc located behind the dsl firewall, but I was wrong… even though all seemed to be configured just fine in the ADSL router still the port unmbers 5800 and 5900 were showing up as closed during nmap scan as well as a simple telnet connection to port 5800 and 5900 failed to get established. My logical assumption was that some configured Firewall on the Windows PC is blocking port connections to 5800 and 5900 thus I decided to check the default Windows Firewall settings as a first possible cause for the vnc ports being blocked. However weirly enought it seemed the Windows Firewall was disabled e.g. the Off (not recommended) option was set for the firewall. The default behaviour of NOD32’s Persnal firewall was extremely restrictive and I found it’s causing a port filter of the 5800 and 5900 vnc connection ports. New button to add new personal firewall rule. Next on I added in the same manner an allow rule for port 5900. After this settings I restarted the NOD32 firewall to make sure the new settings takes place by pressing over the Personal firewall button Disable filtering: allow all traffic and right after enabling the firewall once again. Wi-Fi signal range is divided into a number of smaller bands or “channels,” similar to television channels. I decided to run my wireless on channel 12 since this there was no other wireless routers operating on that frequency, though most routers are preconfigured to spread it’s signal on channel 6. There is a difference in channels available for setup for 802.11b and 802.11g wireless networks in the United States and the European Union. In the USA the wireless channels available are from (1 to 11) whether in the EU it’s in the range of (1-13). Each of the Wireless channels run on a different frequency. The lower the number of the channel is the lowest the radiating frequence band on which data is transmitted .Subsequently, increasing the channel increases the frequency slightly. Therefore the higher the channel you select on your AP the lesser the overlap with other devices running on the same channel and thus the lesser the possibility to overlap and interference. It’s quite likely that you experience problems, if you use the default wireless channel which is 6. If that’s the case it’s recommended to use either channel 1 or channel 11. In case of interference, i.e. overlap with other wireless networks, cellphones etc., there are 2 possible ways to approach the situation. In case of smaller interference, any change in channel on which there is no wireless device running could fix it up. The second way is to choose a wireless channel for your router in between 1,6 or 11 in (The USA) or 1,7,13 in Europe. Up to 3 networks can run on the same space with minimum interference, therefore it would be a wise idea to check the list of wireless routers in your and check if there are others running on the same frequency. As I mentioned in the beginning of the post I initially started running my wireless on channel 12, however after I discovered it is recommended to run your wireless router either on channel 1 7 or 13 in Europe I switched my D-Link DI-524 wireless router to transmit it’s signal on Channel 13. I should testify that after changing the wireless channel, there was quite an improvement in my wireless connection.For instance before I change to Channel 13 (when my wireless internet was still streamed on channel 12) my wireless had constantly issues with disconnects because of low wireless signal. Back then My wireless located physically in like 35 meters away set in another room, I can see my wireless router hardly connected on like 35%, changing to channel 13 enhanced my connection to the current 60% wireless router availability. It’s also an interesting fact that Opened Wireless networks had better network thoroughput, so if you’re living in a house with a neighbors a bit distant from your place then you might consider it as a good idea to completely wipe out Wireless Router security encryption and abandon the use of WEP or WPA network encryption. In case if all of the above is not working for you, you might consider take a close look at your Wireless Wireless LAN pc card and see if there are no any kind of bumps there. Another really interesting fact to know is that many people here in Bulgaria tend to configure there Wireless Access Points on channels either 1,6 or 11 which is quite inadequate considering that we’re in the EU and we should use a wireless channel between 1, 7 or 13 as prescribed for EU citizens. Another thing not to forget is to place your wireless in a good way and prevent it from interferences with other computer equipment. For example keep the router at least few meters away from PC equipment, printers, scanners, cellphones, microwaves. Also try to put your wireless router on some kind of central place in your home, if you want to have the wireless signal all around your place. At my place I have a microwave in the Kitchen which is sometimes an obstacle for the Wireless signal to flow properly to my notebook, fortunately this kind of interference happens rare (only when the Microwove is used to warm-up food etc. ).Upgrading 802.11b wireless card / router to a better one as 802.11g is a wise idea too. 802.11g are said to be like 5 times faster than 802.11b. You can expect 802.11b wireless network to transfer maximum between 2-5 Mbp/s whether 802.11g is claimed to transfer at approximately (12 to 23 Mbp/s). If even though the above prescriptions there is no wireless signal at some remote place at your home, you might consider adding a wireless repeater or change the AP router antenna. 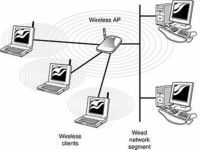 By default wireless Routers are designed to be omni-directional (in other terms they broadcast the wireless signal all around the place. Thus is quite unhandy if you intend to use your Wireless net only in certain room or location at your place. If that’s the case for you, you might consider upgrading to a hi-gain antenna that will focus the wireless signal to an exact direction. Let me close this article with a small diagram taken from the net which illustrates a good router placement that will enable you to have a wwireless connection all over your place.